The much awaited Taxi of Tomorrow will make its debut at the New York International Auto Show next week! 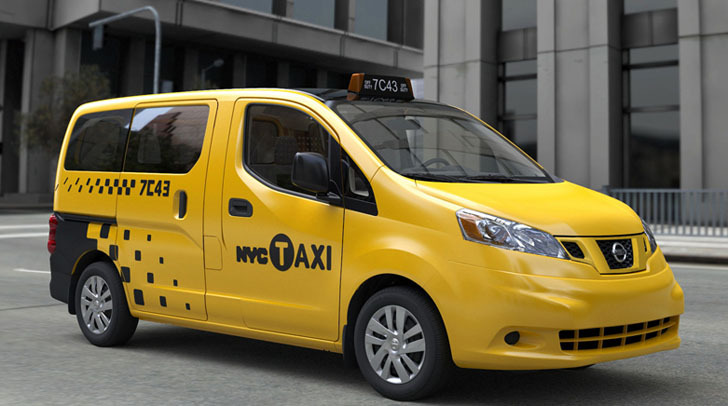 Last year, the Nissan mini van model NV200 won a city-wide competition to be the new New York yellow cabs. The boxy new taxi exceeds the current taxis in fuel efficiency and safety, and it is planned to replace the current fleet over the next several years. This week, New Yorkers will be introduced to the future of our taxi fleet, the Nissan NV200, through a new TV commercial. Leading up to the big reveal at the auto show, advertisements, including billboards and ads on existing taxis, for the vehicle will start to circulate this week in preparation for the launch of the innovative taxi. Over the next 15 months, five of the new vehicles will hit the streets. Tourists and New Yorkers alike will love the incredible views of the city that the Nissan’s oversized glass moon roof allows — the roof’s gorgeous perspective of the rising city above can’t be seen through the traditional side windows. Passengers will also have more control in the new cabs, with an AC and heat adjustment panel. Interior air will be kept fresh by a grape phenol-coated air filter, and anti-microbial seat technology will keep the car 99 percent germ free. The new cab also features more legroom and storage, as well as passenger airbags which previously were only located in the front (and thus behind the partition). The cab also made environmental strides, as it is fuel efficient, has enhanced emission performance, and the floor it made from recycled tires. The new fleet is expected to gradually replace the current taxis throughout the city. After the initial five vehicles to be released, the first wave of NV200s will hit the streets in 2013.